On the 25 September at 8:30 a small crowd started gathering outside Lloyd’s Chambers, Portsoken Street. Excitement was building, but for 5 members of that crowd excitement was quickly being replaced by trepidation as the task ahead loomed large, three days of cycling from London to Paris raising funds for Rainbow Trust! With all riders present, the support car loaded there was nothing more for us to do than to hit the road. The flats made for some very enjoyable cycling and we made great progress through the first section of the Avenue Verte. This was until our first of two punctures hit the team, fortunately for us, we had an excellently prepared support car driver en-route to provide us with a spare tube. We all knew the third and final leg of the tour was going to be our toughest test yet despite the slightly lower milage we had to cover that day. The team had tired legs and one of our team members, Janka, was cycling through some intense pain in both of her knees. To add to this, the flat starts of the first two days were not replicated on day three so we set about scaling the biggest hill of the weekend with 130 miles already behind us. It was here that the team witnessed the taming of the hill - Janka, now in real agony had some choice words for the hill and it duly stepped aside and let us through. We decided to break for lunch here to give those involved time to compose themselves for the final push. And what a push it was! Janka pushed through and could see the end goal in sight and fought through the pain as we got closer and closer. Soon we were on the Avenue de Paris and less than 10 miles from our goal. The suburbs gradually got more urban and we caught our first glimpse of the end goal, the Eiffel Tower. On we went and although seriously flagging out spirits were high as we knew the end was near. 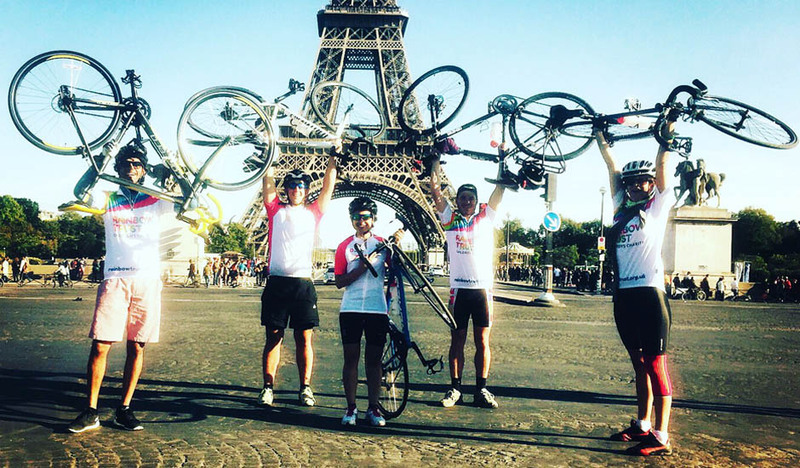 What a feeling to arrive at the foot of the Eiffel Tower having completed our challenge. After we had unloaded the car and said a truly deserved thank you to Andy, our driver, it was time for a few drinks. As we made our way back to London via a tunnel under the sea thoughts turned to what we had achieved not only over the weekend, but in the three months preceding the event. We had all been fortunate enough to have a platform to raise vital funds for Rainbow Trust and support their awe-inspiring work. The proper challenge here is the one that Rainbow Trust embarked on almost 30 years ago. The work they do is not just important, but rare in its scope and reach. Helping not only the child affected by terminal or life-affecting illness but the family as a whole with practical and emotional support during their darkest hours, weeks or years. The magnitude of this task and importance of its execution could never be overstated. Big thank you has to go to Rainbow Trust who provided us with great support throughout the organisation of the event. And finally, thank you to all the generous people who sponsored the team and helped us reach our goal! We feel privileged to have taken part in this event and to have had the opportunity to raise funds for such a great cause.